Allowing the story to do the work of an informed booklet note leaves the listener at something of a loss. Does one, therefore, simply listen to 21 Minuets in a row? I’m afraid one does – or doesn’t, according to taste, though one needs to be something of a dance-patterned epicurean to do it. 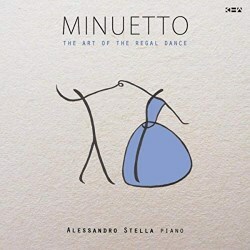 Alessandro Stella is the pianist responsible for all this and true to form he is so self-effacing that nothing as vulgar as an artist biography or publicity photograph appears in a booklet devoted to Maupassant in its entirety. Yet it’s clear that he is a pianist with a strong technique and indeed checking online will indicate that he is an active performer with interests in Ravel and Grieg, among many. He has certainly been recorded, at a good-sounding Steinway D, in an intimate studio acoustic without much cushioning; the resultant sound is not hard, but it does not bloom, either. Many of the pieces hover around the one-minute mark; Purcell’s A minor Minuet, say, or that extracted from the eighteenth-century Lodovico Maria Giustini’s Sonata in C minor (interesting to hear) or indeed Bach’s Minuet in G minor, BWV842. There’s jauntiness in the reading of Beethoven’s G major Minuet and non-staccato warmth to the Rameau and his reading of the less-well known Johann Krieger is charmingly phrased. So, there are intriguing composers to be encountered on a journey that you will have to undertake unguided by the documentation. It would be a shame never to encounter pianist Ricardo Viñes’ evocative melancholy in his Minuet devoted to the memory of his exact contemporary Ravel, as indeed it would in the case of the standout Dussek piece from his Sonata in F minor, Op.77. The longest work is Dvořák’s and it’s played with judicious attention to detail at a good tempo. I quite enjoyed the purely pianistic Handel and the disc ends with Barber’s pastiche Menuetto from Themes No.1. In conclusion, this is a concept album that gorges on Minuets; notes are in the form of an essay by Maupassant; there’s a slightly cool recorded acoustic and only 47 minutes of music. Most but not all the pieces are excerpted from larger works. Is this a celebration or a memorial for the Minuet? Perhaps it depends if you sympathize with that definition of the old dancer in Maupassant’s story. Perhaps it’s both. In any case, from a marketing perspective and even with a variety of composers on board this will be, to be frank, a tough but rather intriguing sell. Jan Ladislav Dussek: Tempo di minuetto con moto, Canone alla seconda, from Sonata in F minor, Op. 77 "L'invocation"